The Tilt-a-Rack® 350ARV Mini Scooter Carrier makes transporting the popular travel scooters, smaller power chairs and manual wheelchairs easier than ever. 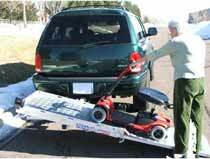 The Tilt-a-Rack® Scooter Carrier is easy to install and use. There are no electronic components. Gravity and balance work for you! 24" x 44" useable space. All aluminum construction makes the 350ARV Mini the lightest choice available. usable area: 24" x 44"
The two set bolts eliminate the minute movement of the hitch bar when inside the hitch receiver. They are tightened to the face of the receiver immediately after you attach the carrier to your vehicle. Works with a 2" class III hitch (standard). For low or smaller vehicles, add the height-adjustable Class II or III hitch bar.